Plans for the school were drawn up in August 1913 and the building work by Pollard & Sons of Bridgwater began in June 1914. 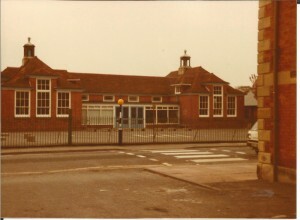 “new Infants School which is being erected on the site up till recently occupied by the ‘tin school'”. Despite a strike by workmen work was completed in January 1915 when “it is anticipated that the new school will be formally opened at Easter”. Perhaps with the onset of the first World War the opening ceremony was delayed until the school first accepted its pupils on Monday 15th June, 1915. The head teacher was Mrs A J Randell who welcomed 120 pupils to their new building. Return to the heritage trail index page.